Temple’s P.J. Walker has a monumental task ahead of him in Saturday’ game against Notre Dame. PHILADELPHIA—The City of Brotherly Love will become one of the nation’s largest college towns this weekend with all the pomp and circumstance accompanying the game where unbeaten, No. 21 Temple (7-0, 4-0) will try to prove it belongs among the elite teams in college football when it takes on No. 9 Notre Dame Saturday night at Lincoln Financial Field in front of nationally-televised audience. As an event, this game is probably the second biggest thing to happen to Philly since the recent visit of Pope Francis. It’s so big that the cast and crew of ESPN’s College Game Day will take over Independence Mall for it’s weekly college football preview show. In other words, for this weekend at least, the entire city will be Temple University’s Main Campus. Meanwhile, on the field, the Owls will face their biggest non-conference challenge in a Notre Dame squad that is still in the running for the four-team College Football Playoff. If Temple can pull off the upset, it can make its own case for a seat at that table. But despite all of the distractions, and let’s face it, College Gameday and everything that goes with it is a distraction, Temple head coach Matt Rhule said the focus of his team is not going to change in terms of doing the things they do well. The Notre Dame (6-1) squad the Owls will be facing is a team that’s had its share of adversity and has somehow fought its way through it. Even though the Fighting Irish lost starting quarterback Malik Zaire to a season-ending ankle injury, DeShone Kizer has stepped in to fill the void and has done well. 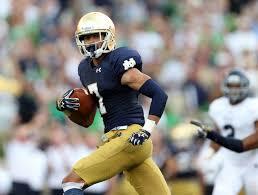 Notre Dame wide receiver and Philadelphia native Will Fuller has the attention of the Temple defense. Kizer has passed for 1,370 yards, completed 65 percent of his passes and has thrown 10 touchdown passes. It also helps that he has some solid weapons at his disposal. Notre Dame’s best receiver is Philadelphia native and former Roman Catholic star Will Fuller, who leads the Fighting Irish in receiving with 32 catches for 702 yards and eight touchdowns. Temple’s defense, which ranks eighth in the nation in scoring defense, will also have their hands full with running back C.J. Prosise, who is averaging 7.1 yards per carry. He has gained 922 yards and has scored 11 touchdowns. On the offensive line, the Fighting Irish are led by a pair of mid-season All-Americans in center Nick Martin (6-4, 301) and left tackle Ronnie Stanley (6-5, 315). Offensively, Temple has its own set of weapons in quarterback P.J. Walker , who’s having a solid season passing the football. He’s completing close to 60 percent of his passes and had nine touchdowns. In the win over East Carolina, Walker completed 19-of-35 passes for 250 yards and one touchdown. He said his team will be ready for the Notre Dame defense. Running back Jahad Thomas said the Owls have to come into the game focused on beating a Notre Dame defense, led by All-American linebacker Jaylon Smith, who leads the Fighting Irish in tackles. “It’s not that we’re getting excited to play the Irish, but we know it’s a great opponent ahead of us, but we’ve got to come out and do the things we’ve been doing and just be ready to play,” Thomas said.